Our John Muir quotes collection speak to his love of nature and the environment. Known famously as the Father of the National Parks or John of the Mountains, John Muir is among the most revered naturalists, tree-hugger, and outdoor enthusiasts from America. It is believed that he played one of the most important roles in preserving much of the forests in various parts of the United States. 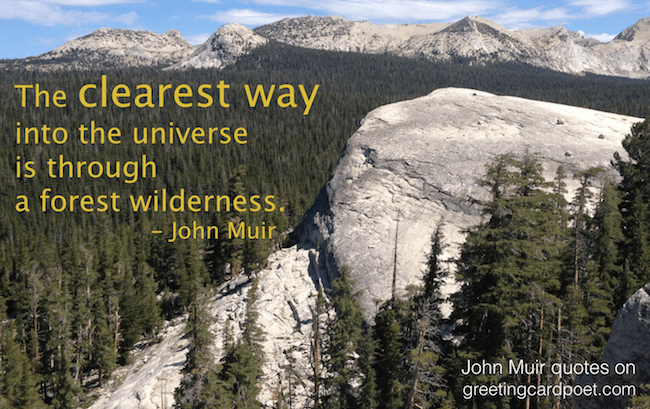 Muir’s love for nature and his environmental activism helped in preserving many wilderness areas in the country, the most famous among which are the Sequoia National Park and Yosemite Valley. His essays, letters, poems, and books on his adventures, findings, and suggestions have inspired the world. Here are some of John’s famous quotes that can be as inspiring to the generations of the future as they were to those of his time! The sun shines not on us but in us. The rivers flow not past, but through us. Thrilling, tingling, vibrating every fiber and cell of the substance of our bodies, making them glide and sing. Earth has no sorrow that earth can not heal. When one is alone at night in the depths of these woods, the stillness is at once awful and sublime. Every leaf seems to speak. I bade adieu to mechanical inventions, determined to devote the rest of my life to the study of the inventions of God. Come to the woods; for here is rest. There is no repose like that of the green deep woods. There are no accidents in Nature, he said. Every motion of the constantly shifting bodies in the world is timed to the occasion for some definite, foreordered end. The flowers blossom in obedience to the same law that marks the course of constellations, and the song of a bird is the echo of a universal symphony. None of Nature’s landscapes are ugly so long as they are wild. Hiking – I don’t like either the word or the thing. People ought to saunter in the mountains – not hike! Who wouldn’t be a mountaineer! Up here all the world’s prizes seem nothing. Few places in this world are more dangerous than home. Fear not, therefore, to try the mountain passes. They will kill care, save you from deadly apathy, set you free, and call forth every faculty into vigorous, enthusiastic action. I’d rather be in the mountains thinking of God, than in church thinking about the mountains. One day’s exposure to mountains is better than a cartload of books. Doubly happy, however, is the man to whom lofty mountain tops are within reach. Storms of every sort, torrents, earthquakes, cataclysms, ‘convulsions of nature,’ etc., however mysterious and lawless at first sight they may seem, are only harmonious notes in the song of creation, varied expressions of God’s love. No traveler, whether a tree lover or not, will ever forget his first walk in a sugar-pine forest. I care to live only to entice people to look at Nature’s loveliness. Heaven knows that John the Baptist was not more eager to get all his fellow sinners into the Jordan than I to baptize all of mine in the beauty of God’s mountains. Yosemite Park… None can escape its charms. Its natural beauty cleans and warms like a fire, and you will be willing to stay forever in one place like a tree. God never made an ugly landscape. All that sun shines on is beautiful, so long as it is wild. Bread without flesh is a good diet, as on many botanical excursions I have proved. Tea also may easily be ignored. Just bread and water and delightful toil is all I need – not unreasonably much, yet one ought to be trained and tempered to enjoy life in these brave wilds in full independence of any particular kind of nourishment. So abundant and novel are the objects of interest in a pure wilderness that unless you are pursuing special studies it matters little where you go, or how often to the same place. The world is big and I want to get a good look at it before it gets dark. Keep close to Nature’s heart… and break clear away, once in a while, and climb a mountain or spend a week in the woods. Wash your spirit clean. Wander a whole summer if you can. Time will not be taken from the sum of life. Instead of shortening, it will definitely lengthen it and make you truly immortal. Rocks and waters, etc., are words of God, and so are men. We all flow from one fountain Soul. All are expressions of one Love. Sequoia seeds have flat wings, and glint and glance in their flight like a boy’s kite. The waving of a pine tree on the top of a mountain – a magic wand in Nature’s hand – every devout mountaineer knows its power; but the marvelous beauty value of what the Scotch call a breckan in a still dell, what poet has sung this?